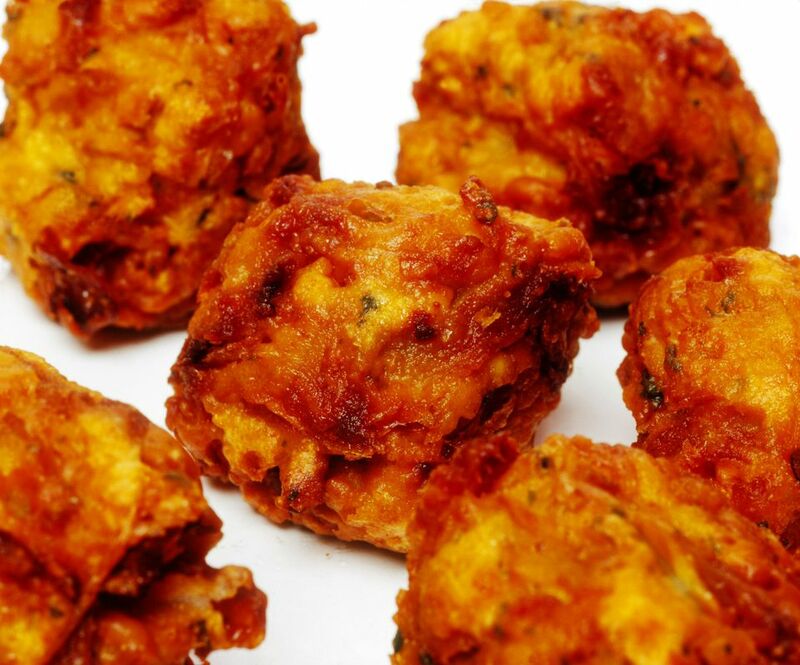 Also known as pakoras, these bhajjis are the perfect snack for a cold, rainy day. Make up a batch, and serve them with sweet and sour tamarind chutney. Use any vegetable you like. Mix the gram flour and all the spices with a little water at a time, to make a thick batter (slightly thicker than pancake batter). Add salt to taste. If using cauliflower, cut it into bite-sized pieces; for potatoes and onions, slice these thin; for spinach leaves, trim the stems and keep only the leaves; for paneer, cut into 1" cubes. Preheat oil, and reduce flame to medium. This will allow the bhajias to cook well both on the outside and inside. Coat the vegetables well with batter, and then deep fry till golden. Drain on paper towels, and serve with tamarind chutney or tomato ketchup.